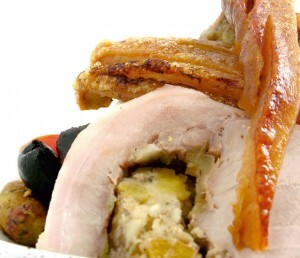 Porchetta combines the best of British rare breed with it’s continental inspiration. Porchetta is a speciality from the Umbrian region of Italy. It is a whole suckling pig boned, rolled and stuffed with fresh herbs and a little garlic. Porchetta is a unique product and makes an excellent centrepiece. Preheat your oven to 200C. Lay the porchetta on a board, skin-side down, and season well with salt and pepper. Massage this seasoning all over the meat. Put a large pan on a medium heat and fry your diced onion with the olive oil for about 10 minutes and when it’s softened but not coloured, turn the heat down to low and add the chopped chicken livers and pork mince. Use a wooden spoon to break the mince up and mix everything together. Add the pine nuts, raisins, chopped sage and parsley, then season with a good sprinkle of salt and pepper. Pour in the red wine, give everything a good stir then take your pan off the heat. You don’t want to cook the meat now, you just want to get a good mix of flavours going so you have a delicious stuffing.